Like any other files you might end up with a deletion or loss of photos from your NTFS drives. If you lose some word or PDF files you can create them with the same information but the photos are such files which cannot be re-created. If you have deleted or lost your favorite photos, here is an efficient way to get them back. You can recover lost photos from NTFS drive by using some reliable NTFS drive recovery software. Clicking photographs is a best way to capture priceless moments of your day to day life. Captured pictures acts like a catalog in recollecting your favorite moments like send-off party, child’s first birthday, wedding ceremony, and so on. Technical revolution has brought a drastic change in photography like ancient cameras and camera films are now entirely replaced by professional digital cameras and memory cards. Professional Digital cameras support different types of memory cards like Compact Flash Card, SD card, XD Picture card, Multi Media card, etc., to store clicked images. Most of the people prefer to store their pictures on personal computers from which it is very easy to access. But there are instances of photo loss too. Let us have a glimpse of few common scenarios leading to image loss. While deleting unwanted pictures from NTFS drive you might accidentally delete some important photos by pressing “Delete All” button. You might accidentally format your NTFS drive without checking the contents. If the formatted partition had some of your favorite photos, then you will lose them. But, by using our powerful restoration software, you can easily carry out formatted NTFS partition recovery and restore lost photos just in couple of moments. If you have, by mistake deleted image files, by pressing the Shift + delete option, then the files are bypassed from Recycle Bin and the pictures is assumed to be permanently deleted. While copying photos between your flash card and computer if you disconnect the device in between without using “Eject” or “Safely Remove Hardware” option, there are chances of losing photos. With a few precautionary measures you can avoid the loss or deletion of your photos. Before deleting any photo or formatting the NTFS partition, just spend a few seconds in examining the contents and priority of the photos which you are deleting. Follow a proper plug and play procedure while copying photos between computer and other device. Whenever a file gets deleted from hard drive, memory card or any other storage device, only the index file will be erased and the particular space will be marked as available, but the actual data still exist in the stored sector until it is overwritten with new data. Such data is inaccessible to the operating system but an efficient file recovery tool will fetch and recover it using unique file signature. NTFS drive recovery software is one such robust recovery tool which is available for Windows operating system. It is developed with an advanced algorithm to recover all popular audio, video and image file formats along with digital RAW photo files. Using this tool you can preview the recovered files before restoring and it allows you to sort them on the basis name, date, size and file type. It restores deleted or lost images from external hard drives, memory cards, pen drives, FireWire drives, iPods, etc. It can also recover deleted or lost compressed files from NTFS drives. 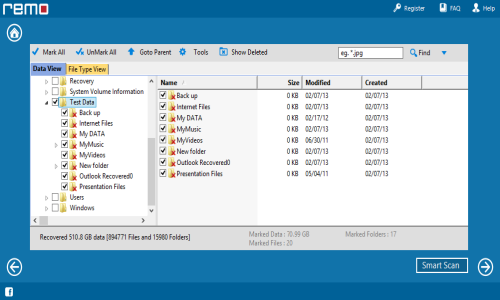 This tool can also recover deleted files from NTFS as well as from FAT16, FAT32 file system. Using built-in “Save Recovery Session” you can stop and resume the recovery process as per your schedules. If you are looking for efficient, safe and secure recovery software then download this utility and check for the recovery results. Employing this tool it is very easy to even restore corrupted NTFS HDD data on Windows operating system. Step 1:	Launch the installed demo version of recovery software to perform lost photo recovery. 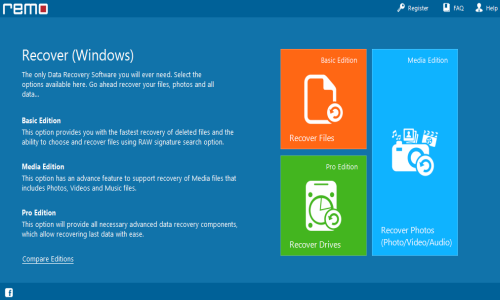 Welcome window will appear with different recovery options as shown in Figure A. Select "Recover Photos" from main menu. 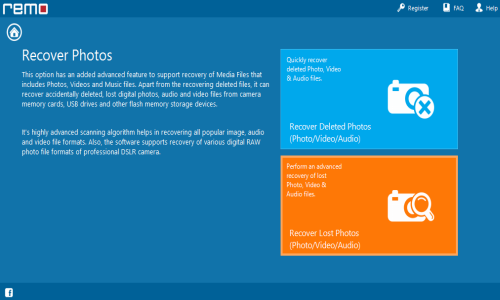 Step 2: Now choose the "Recover Lost Photos" option from the next screen shot to restore lost image files from the HDD as shown. 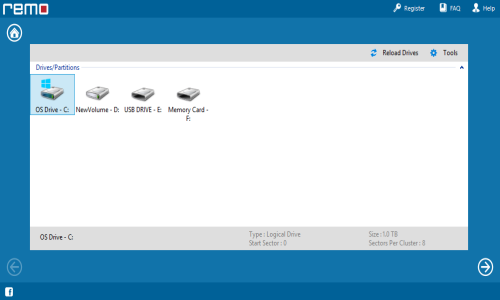 Step 3: Software scans the drive and displays the partion. Select the partition from which you need to restore lost images as shown in Fig C.
Step 4: Software starts scanning the selected partition of your system HDD and displays the recovered data. You can evaluate the recovered results using preview option of the software as shown in Fig D.